Hillary and I both looked towards France for a little onion inspiration this week. Hillary to Chef Soltner, I to Julia. Opening Mastering The Art of French Cooking to the well worn page in which soupe a l’oignon resides will always take me back to the first time I used my big beautiful blue Le Creuset which is now my most cherished item in my kitchen. Each time I make the soup I seem to tweak it a little but its always a version of Julia’s – pure, simple and oh so satisfying. While it’s a very straight forward soup, the onions do take quite some time to reach full carmelization so don’t go trying to rush the process. 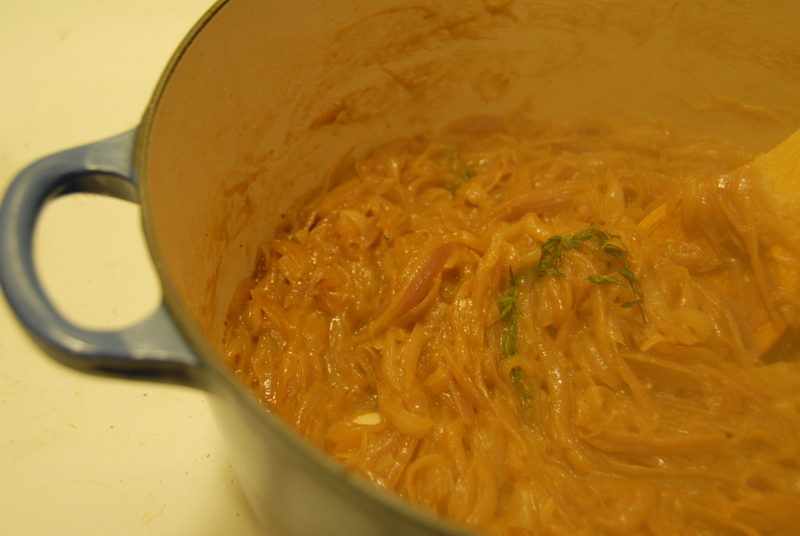 Cook the thinly sliced onions low and slow in butter and oil with the lid of your stockpot on. Cook for about 15-20 minutes until the onions are translucent. Uncover, raise the heat and stir in sugar and salt (this will help the carmelization along). Cook for another 45 minutes or so, stirring often. Add in thyme and garlic cloves about half way through. Cook until the onions have reached a deep, golden brown. At this point season the with salt and pepper. Meanwhile bring the stock to a boil in a separate pot. Once the onions are carmelized sprinkle in the flour and stir. Next add the hot stock and bring to a simmer. Add vermouth and worchestshire sauce. Taste and season. Let the soup simmer, covered for at least an hour (the longer the better really!). Once you’re ready to serve, put a generous amount of cheese (and maybe a dab of butter if you’re feeling naughty) on a piece of bread and place it under the broiler to melt and become crisp. 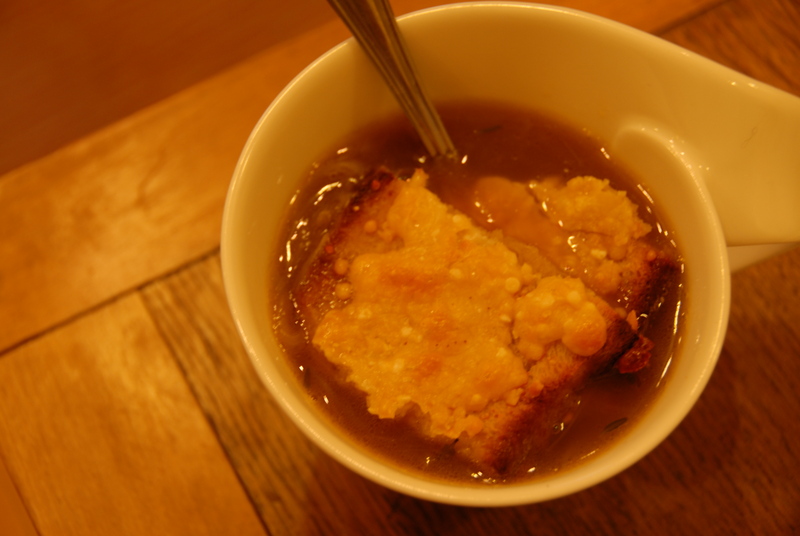 Top the soup with the cheesy crouton and in the words of Julia, bon appetit! This entry was posted in Onions, Uncategorized and tagged french, french onion soup, garlic, Julia Child, onions, thyme, worchestshire sauce. Bookmark the permalink.